1.Position 2 oven racks to upper and lower position. Preheat oven to 450°F. Line 2 rimmed baking pans with parchment paper. In medium saucepot, combine milk, butter, mustard, salt and pepper; heat to boiling over medium-high heat. Add flour; with wooden spoon, stir vigorously until flour absorbs liquid and forms ball. Reduce heat to medium-low and cook 2 to 4 minutes or until film forms on bottom of pot and dough ball is no longer sticky, stirring constantly. 2.Transfer mixture to large bowl. With mixer on low speed, beat 1 minute. Increase speed to medium-low; add eggs, 1 at a time, beating well after each addition. Check consistency of batter by pulling up mixer beater. Batter should form a peak that just falls over on itself. If batter is stiff and peak remains standing, beat in egg white. Reduce speed to low; add 1-1/2 cups cheese, beating until incorporated. 3.In small bowl, whisk egg yolk and water. Drop leveled tablespoons of batter 1-1/2 inches apart onto prepared baking pans. Brush top of gougères with egg yolk mixture and sprinkle with remaining cheese. 4.Bake gougères 6 to 8 minutes or until gougères are puffed and hold their shape. Reduce oven temperature to 350°F; bake 23 to 25 minutes longer or until golden brown, rotating baking pans between upper and lower racks halfway through baking. Inside of gougères should be hollow and just slightly moist. Serve warm or cool completely. 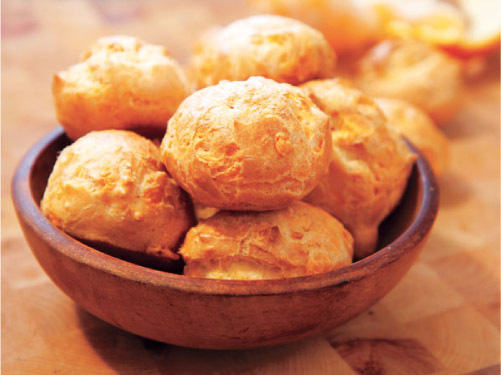 > Baked gougères can be cooled and stored in a covered airtight container overnight or frozen for up to 1 month. Gougères can be reheated in a 350°F oven for 5 to 10 minutes or until heated through.